When it rains, water runs across roads, parking lots, and lawns, picking up pollutants and debris. In order to prevent flooding in developed areas, where the soil is not absorbent because it is covered by pavement or buildings, this runoff, termed “stormwater,” is channeled into storm drains. In nature, wetlands play an important role in the landscape as regulators of flood waters and sinks for excess nutrients and pollutants that are swept up in storm water. Green infrastructure is an approach to water management that mimics natural storage and filtering functions of wetlands by using plants and soils rather than drains and pipes. We don’t yet have a good understanding of which plants are best suited to green infrastructure, so that is the topic of my research. Once stormwater enters a drain, it can have different fates. One type of municipal sewer system is called a combined sewer system. 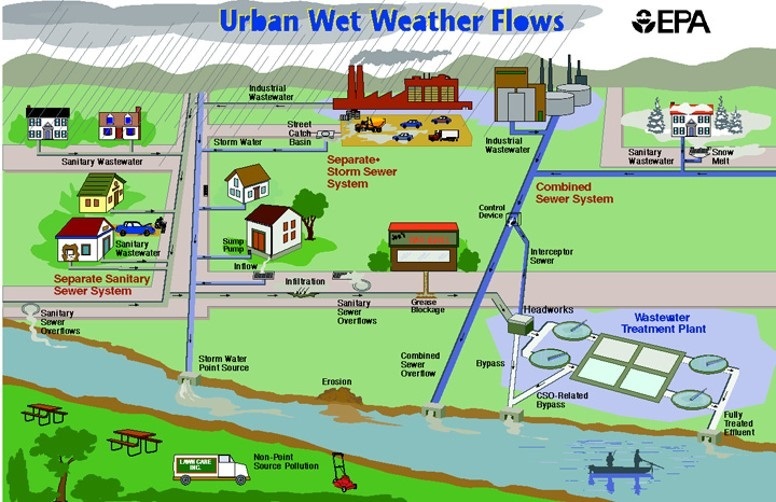 A combined sewer system combines sewage from your house (toilet sewage) with stormwater runoff from storm drains. This creates a large volume of contaminated water that must be treated at water treatment plants. This type of system is more common in older cities in the U.S., and in 21 cities in New Jersey (https://www.nj.gov/dep/dwq/cso-basics.htm). In New Jersey, most combined sewer systems are in cities near NYC, and a few around Philadelphia. The NJ Department of Environmental Protection hosts a web map to show those locations. Figure 1 A combined sewer system. On the left, in dry weather, sewage goes to the wastewater treatment plant. On the right, in the rain, stormwater combines with sewage. The volume is too much for the pipes and wastewater treatment plant, and a mix of stormwater and untreated sewage overflows to the river. The second type of sewer system is a separate system. A separate system keeps sewage containing human waste in one set of pipes, and stormwater runoff from storm drains in another set of pipes. 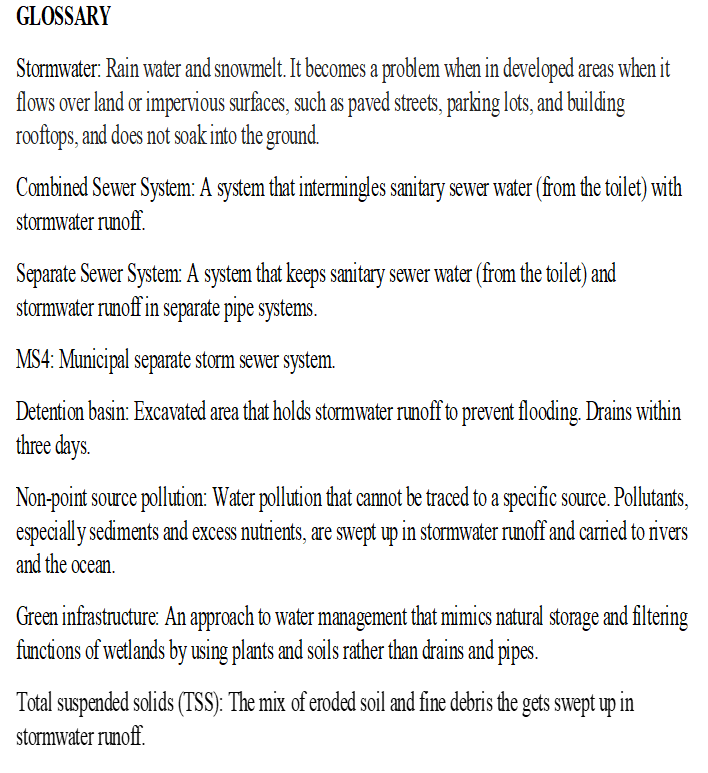 The latter has the the witty nickname MS4 (municipal separate storm sewer system). The sewage goes to a waste water treatment plant, while the stormwater is released to streams or rivers. This relieves pressure on waste water treatment plants and prevents overflows of untreated sewage. However, stormwater is usually contaminated with all of the urban dross it picks up, including pet waste, leaked gas and oil from our cars, excess lawn fertilizers and pesticides. Stormwater moves more quickly over smooth, paved surfaces than rough natural ones, so stormwater can accumulate quickly and cause floods. 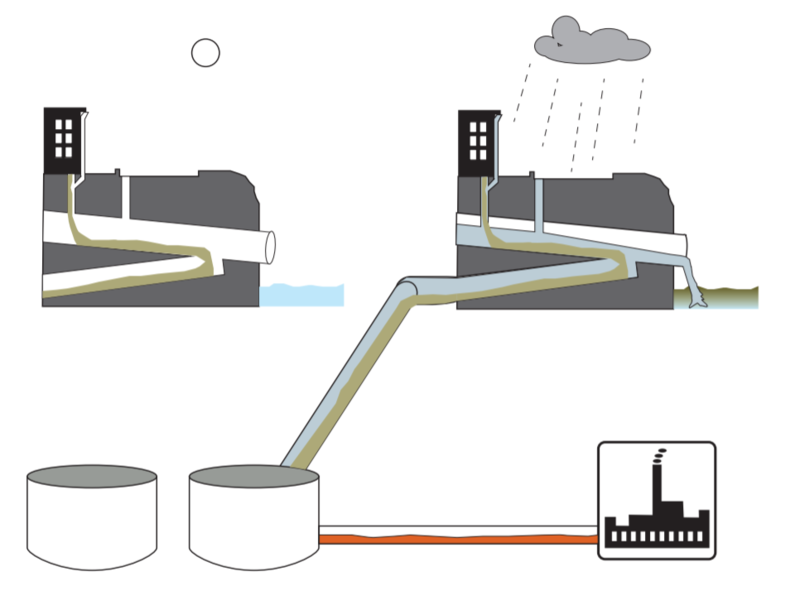 Figure 2 An illustration of the different types of sewer systems. On the left: separate storm sewer system. On the right: combined sewer system. In New Jersey and many places in the U.S., water from storm drains is temporarily stored in artificial detention basins or ponds before draining to streams and rivers. In principle this prevents the water from a rain storm from concentrating in a stream all at once and flooding its banks. A detention basin receives water from the storm sewer, then passively allows it to drain out the other side. The outlet pipe is small though, restricting the water leaving the basin to a low, steady volume. Detention basins were originally designed for flood control, but we are now realizing that they could be redesigned to provide more functions. The expanded functions for detention basins include pollutant filtering, ground water recharge, and provision of habitat. Most detention basins are lined with grass that is mown weekly or biweekly like a lawn. In order to increase the functions of the basin, managers are changing to a mix of dense vegetation that is mown annually. This simple change can have a big impact and is the subject of my research. In my next post I’ll talk more about why I’m interested in studying detention basins, what I hope to find out, and how it can change our watershed for the better. Interesting article, thanks. I share your interest in stormwater management, wetlands, streams, watersheds, and plants. In the photo of the detention basin, what’s the purpose of the concrete sluice running through the center? Does this concrete sluice prevent stormwater from soaking into the ground and recharging groundwater? Are the soils in detention basins compacted? Is so, does this minimize their capability to absorb stormwater and recharge groundwater? Do stormwater detention basins affect groundwater levels by causing the surrounding land to dry out more quickly after storms? Do detention basins breed mosquitoes? Is a “rain garden” different from a stormwater detention basin? Hi Ed, Thanks for the questions and interest!. -The concrete low-flow channel keeps the grass dry so that standing water doesn’t cause bare patches and it’s easy to mow. Yes, this prevents water from contact with soil and soaking in. However, as you mention, the soil is usually very compacted and does not infiltrate water well. -Groundwater levels can be affected, but it’s not because of the detention basins. It’s because of impervious surface around detention basins (paved roads, buildings, parking lots, etc.) that prevent water infiltration into soil. 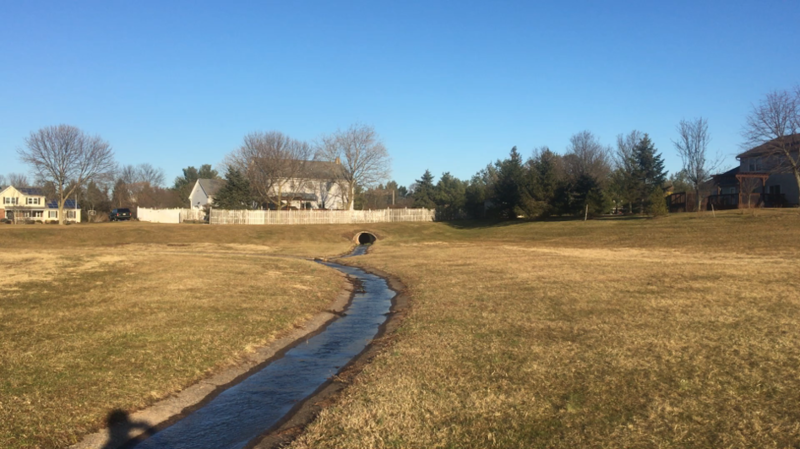 Impervious surface is actually the reason that extensive stormwater systems are needed–they shed all of the water that would otherwise soak into the ground. -Detention basins are monitored by the state mosquito control board. They are designed to drain within 72 hours, the time it takes for mosquitoes to develop into adults. So they are designed not to breed mosquitoes. I don’t have information about actual conditions. -Rain gardens are different because of design and context. Detention basins in the state must meet design criteria. I think that rain gardens are not bound to any particular engineering standards. Rain gardens are usually smaller, designed to have aesthetic appeal, and designed to infiltrate water. Detention basins are usually larger, regulated, designed to hold and drain rather than infiltrate, and not designed for beauty!